In the mood for a good cold brew? 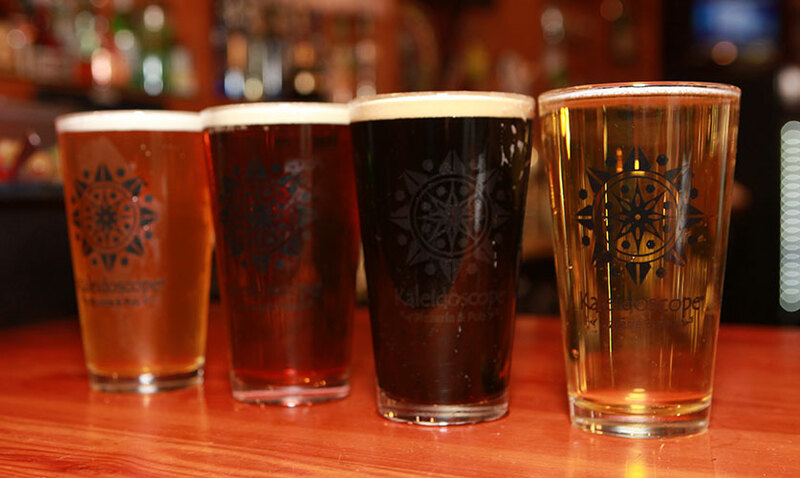 Kaleidoscope Pizzeria offers some of the Pacific Northwest’s finest ales, featuring selections from Walkabout, Deschutes, Caldera, and many more on a rotating basis. In the mood for something else? In addition to beer, Kaleidoscope offers an impressive selection of award winning local wines—by the glass or the bottle—and a full bar of all of your favorite mixed or blended drinks. Pair one of our gourmet pizzas with your favorite local ale, glass of wine, or cocktail, and make your dining experience complete, unique, and distinctly Southern Oregon! A graceful approach of minerality beckons to classic flabors of stone fruit and pineapple, with hints of honeysuckle and blossoming orange. Lively yet full on the palate. We are very pleased to offer this special summer treat (by the glass only) which begins with aromas of pineapple and lemon leading to flavors of pear and white grapefruit. Polished, lively and refined with aromas of white peach, kiwi and green apple. Rich with citrus-laced creamy nectarine flavors, framed in a subtle vanilla oak finish. A pleasing harmony of flavors will greet your palate offering up notes of pear, tangerine and honeysuckle. This moderate to light bodied wine finishes crisp. One of the world’s most popular White Zinfandels. Slow cool fermentation highlights its fresh aromas and flavors of summer berries, citrus and honeydew melon. This wine has a mouth-coating palette of ripe plum, black cherry flavors with supple tannins, well integrated oak, and a long-balanced finish. This medium bodied red boast’s bright red fruit flavors with a lingering finish. This full-bodied Tempranillo has strong notes of ripe blackberry, black cherry, and subtle hints of white pepper. It is rich with earthy tannins, balanced acidity, and a velvety finish. Shea is one of the foremost vineyards in the Willamette Valley. Designated as an Editors Choice by Wine Spectator, this 2015 vintage is a classic expression of Oregon Pinot Noir. A knockout wine. Crisp and intense red fruit on the nose and on the palate. Jammy strawberry aromas dominate, along with raspberry, vanilla, basil, and tomato leaf. Medium high ripe tannins, high acidity, a long finish. This richly hued (and underpriced) Pinot Noir is as intriguing as it is attractive. The nose offers a smoky minerality and a warm taste of vanilla-laced blackberry jam. cherry and oak. The tannins are rich and balanced with hints of dark chocolate on the finish. A smooth drink of blackberry, blue currant and blueberry fruits. Nicely tannined with a silky smooth finish. Another EXCLUSIVE wine! This red is a “Super Tuscan” blend of Cab Sauv, Sangiovese and Zin with notes of dark chocolate-covered cherries and a rich smooth finish. These carefully selected wines include a wide array of Southern Oregon. We try to keep all of our listed wines in stock. However, we do not update this list with each vintage change or when a wine becomes unavailable. Your understanding is appreciated. Most of our listed wines are available 'to go' for $8.00 off the Wine List price. Ruby Red vodka, X-Rated passion fruit liqueur, Arancello, orange juice, pineapple juice and a splash of lemonade. Crown Royal Apple, Apple Pucker, sweet & sour and cranberry juice. An “adult” strawberry lemonade ~ Citrus Vodka with lemonade and a strawberry puree. Malibu Banana rum, Malibu Coconut rum, Midori, pineapple and sweet & sour. Name says it all. Our Root Beer poured over a healthy two ounces of Vanilla Vodka and topped with whipped cream. Spicy: Substitute our house infused Habenero Vodka to kick up the heat! Malibu Coconut rum, Kahlua, vanilla vodka & butterscotch schnapps with a splash of half & half. Pomegranate Vodka with splashes of Triple Sec and pomegranate juice. Delicious! Habanero-infused Super Fly potato vodka and X-Rated Liqueur. Not for the meek or the mild. Wild Roots Pear vodka, mango rum, peach schnapps and pear syrup. Chocolate vodka, Godiva white chocolate liquor, Kahlua and cream. Chocolate vodka, Godiva white chocolate liqueur and Rumple Minze in a chocolate swirled glass. Apple vodka, butterscotch schnapps and a splash of sweet and sour in a caramel swirled glass.